Rundle Mall has been Adelaide’s premier shopping district since its pedestrianisation in 1976. Today it comprises over 700 retail stores, 350 commercial businesses, three department stores and 15 arcades connected by 10,000 sqm of open public space. 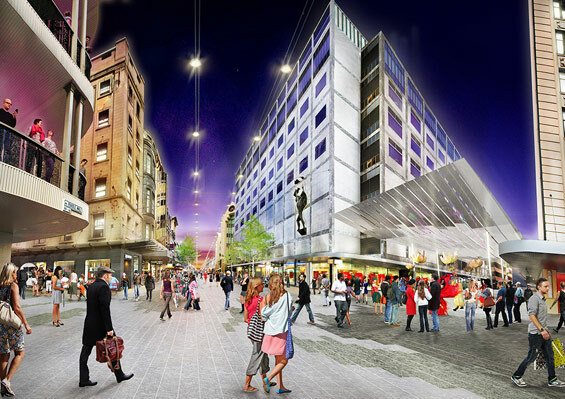 HASSELL, together with ARUP, has been engaged to lead the detailed design for the Mall’s redevelopment. 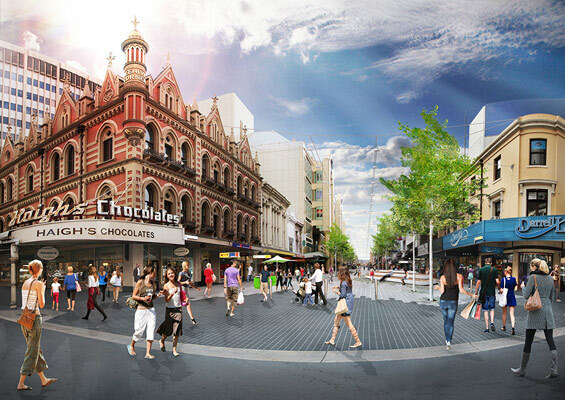 The Adelaide City Council initiative is set to revitalise Rundle Mall and secure its future as an exciting, prosperous retail precinct and civic core. The vision is to reveal and recast the Mall as a flexible, urban environment for connection and exchange. The HASSELL/ARUP design maximises its spaciousness, enables the environment to change over the days, weeks and seasons, and promotes social interaction and connection to the city and beyond. It opens up the Mall to the public by relocating or removing superfluous structures from the central spine and redefining its character through the incorporation of distinctive stone paving and bespoke urban elements that reference the natural landscape of South Australia. A greener identity is established through the doubling of trees along its length, increasing shade, improving amenity, and framing views including those of the notable architectural heritage. A catenary lighting system illuminates and activates the space at night, enabling customised lighting scenes that use colour and create focal points for events. ‘Plug and play’ services (power and water connections) are incorporated along the length of the Mall, providing opportunities to host a mix of temporary social, cultural, retail and entertainment activities. The careful curation of these ‘pop-ups’ will ensure the environment is continually changing and providing new offers that appeal to visitors. 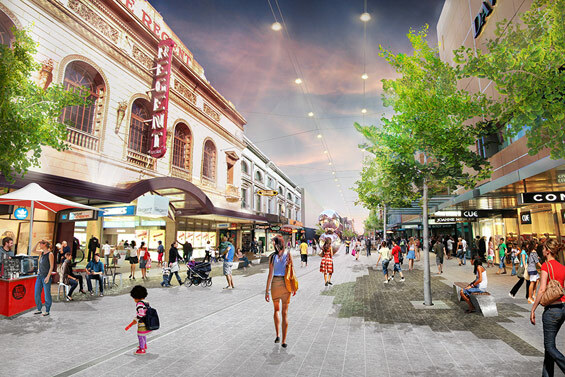 The redevelopment will strategically reposition Rundle Mall – creating a captivating place that attracts a broader cross section of visitors and encourages them to stay longer – providing a robust and resilient foundation for its future.